Allen Gannett and I met for the first time this summer. 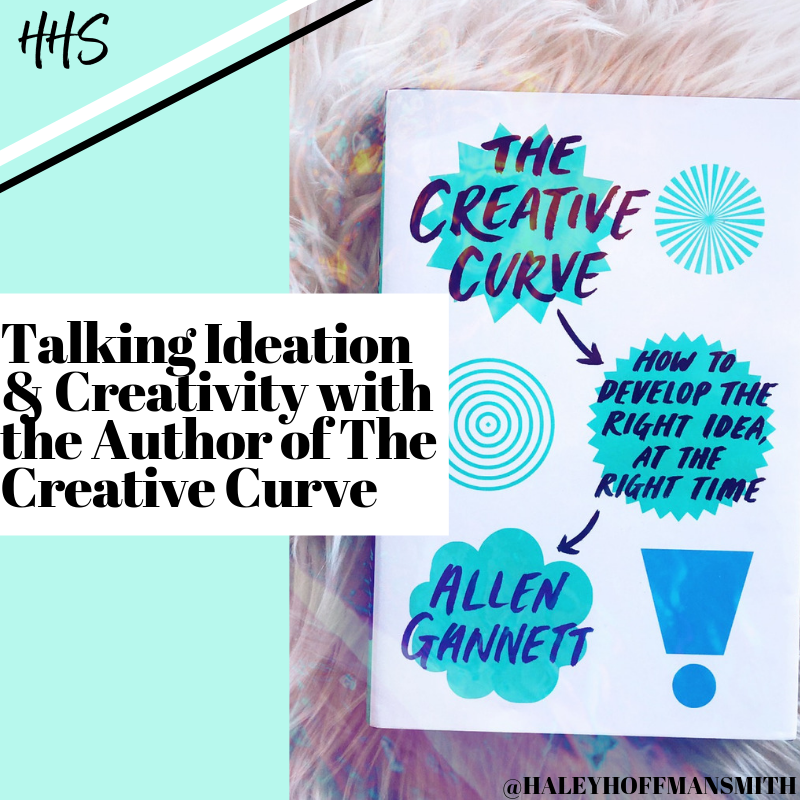 A mutual friend introduced us in anticipation of Allen’s book, The Creative Curve, and I was excited to meet someone who had studied the psychological and tactical processes behind creativity and ideation in depth. Busy as ever, Allen was jumping into a cab when we got on the phone. But even with his hectic schedule, he didn’t miss a beat. He gushed with stories behind the creative processes of all the great creatives of our time, and those who preceded them. Creatives like J.K. Rowling and Paul McCartney. I scrambled to take down all of the stories and all of the wisdom. Over nine months later, I’ve just wrapped up a speaking tour for my own book, HerhBig Idea, that I called “Your Big Idea.” I quote Allen and his book’s stories in every talk I give. Now, Allen and I are back with a Round Two feature, diving deeper into the ideation process. Haley Hoffman Smith: What are the biggest misconceptions you hear about creativity and coming up with ideas? Allen Gannett: People think that creativity is this supernatural force. It rolls into certain chosen people, leaving great ideas in its wake. It’s uncontrollable and impossible to conjure on command. The issue is that this is a complete farce. Creativity is a perfectly normal function of our brain — our right hemisphere, to be precise. Our mind is talented, assuming we have the raw cognitive material, at creating new and exciting ideas. In fact, there are numerous studies that show that someone with average or higher-than-average intelligence has immense creative potential. HHS: What are two or three things anyone could do today to become a fountain of ideas? AG: There are two things I recommend every aspiring creative do. The first is to consume more. We often think of creatives and consumers as opposites of each other. Creators do. Consumers consume. However, in my research, I found that the best creatives are also obsessive consumers of their creative niches. They go deep in their vertical. This is important because for our right hemisphere to generate ideas, or as you might say, connect the dots, you need to have the dots to connect. You need to have the raw materials for your divergent thinking to actually process. I found numerous stories of vast consumption by creative greats. Ted Sarandos, the prolific chief content officer at Netflix, told me about how he started his career as a video rental store clerk who decided to watch every single movie in the store. J.K. Rowling famously got library fines in college because she had so many books out. Consumption is a critical step to creativity. Another thing I was surprised by was how important silence is to the creative process. Creative achievers find some practice, whether it’s meditation, long walks, or even their commute, where they are able to experience silence. This is critical because the ideas that percolate in our right hemisphere are right below our level of consciousness. You can’t experience them if you’re continually buzzing with activity, fluttering on your smartphone or talking to the people around you. As a result, you hear countless stories of great creatives nurturing silence. Steve Jobs would take long walks. Bill Gates spends a week each year in a cabin by himself. To create more, give yourself more raw ideas, and then give yourself space and quiet to actually process them. HHS: How can budding entrepreneurs “test” their ideas to separate the good from the not-so-good? AG: One of the biggest mistakes that entrepreneurs make is thinking that the product with the most features or even the “best” features win. The ideas that win are the ideas that a market is ready for. In 2004, CampusNetwork launched a month before Facebook at Columbia University. It had more features, many of which Facebook would only implement years later (like the news feed). But it lost. Why? Well, at the time, people were still getting used to the idea of using their real names on the internet. That was a jump they were willing to make. They were not ready to broadcast so much of their online activity. The result was that Facebook, with its (very) modest interface and set of features, became the conglomerate it is today. It was willing to take it slow and follow its audience. 1) How unique is this idea? 2) How likely are you to buy it? The best ideas are not the ideas that score the highest on likeliness to buy. Often, those are the ideas that are too safe. They will be too similar to the existing market options. On the other hand, ideas that score high on uniqueness are often too radical for mass adoption. You want ideas that are the highest blend of both originality and comfort. HHS: Transforming an idea into a business can be hard — how do you recommend young entrepreneurs get started? AG: To start any creative project, whether it’s a company or an artistic career, there are two human things you have to address. First, most people have told themselves a lot of stories about the limits. This negative self-talk can come in many formats: I’m too young to do that; my teacher said if I get an art degree, I’ll become a barista; the list goes on. To take on any creative venture, you have to be willing to re-examine these notions of yourself. Interrogate them. Where did they come from? Are they really true? What you’ll find is that they’re almost always illogical. They’re values or insecurities that other people have projected on you. By being aware of them, you can start to do the hard work of convincing yourself they’re not true. The second thing is that you need to have a “creative community” around you. If you want to build a business, you have to shake the idea of the solo genius CEO. Steve Jobs had Steve Wozniak. He raised money early on and had multiple employees in a suburban garage with him. Successful creatives are self-aware about their weaknesses and find other people to overcome those weaknesses. There’s a range of people, from collaborators to teachers and even promoters, that you need in a creative community. For many people, the biggest impediment to this is location. If you need to build a creative community, you need to be willing to move to a place where you can actually create that community. This is why you see startups being pulled to San Francisco, screenwriters to Los Angeles, and so on. HHS: What’s one thing you wish you’d known about creativity when you were younger? AG: I wish I had known how possible creative success was. As humans, we have this incredible ability to learn new skills. In my book, “The Creative Curve,” I explain why scientists say Malcolm Gladwell misinterpreted the research on this with this “10,000 hours rule,” but the idea that we have an ability to achieve great feats through intense practice is directionally accurate. Sometimes it takes much more, or much less, than 10,000 hours, but that’s a story for another day. If I were younger, when time was ample, I would have loved to have leveraged this into learning other skills (maybe painting!). The good news is that neuroplasticity and neurogenesis mean our brains perpetually adapt, and we can still learn much later in life. The bad news is that we have less time for learning as we grow older. What resonated most with me about Allen’s insights was the connection to the personal. We are deeply tied to what we create. If we do not feel that we can create, or we have a diminished since of agency over what creation can lead us to, we are less likely to share our gifts with the world. Thanks to Allen for sharing more spectacular insights.